The LE Pure Color Collection for Fall 2010 features smouldering eyes, shimmering lips and bold nails. The complete make-up collection includes two distinct looks : Blue Dahlia and Surreal Violet. Eyes take centre stage in hues of electric blue and vintage violet, while lips shimmer in subtle shades of pale pink and raspberry. Deep navy and iridescent lilac nail polishes complete the look. Key items include the Pure Color EyeShadow Palettes in Blue Dahlia and Surreal Violet. 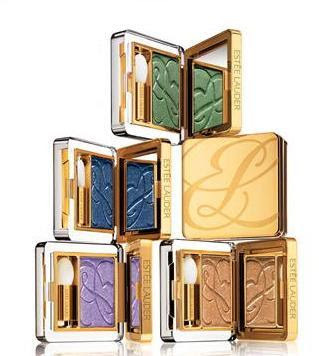 Each contains five shades presented in a golden, mirrored compact complete with oversized Estée Lauder cartouche. The lip offer features Pure Color Gloss Sticks and Pure Color Glosses, in shades of raw pink and magenta, for a subdued lip look to balance strong eyes. A deeper berry shade (Midnight Bloom) delivers a stronger pop of colour. Pure Color Gloss delivers lasting shine, maximum moisture and three multi-dimensional finishes. The glosses incorporate multi-functional humectants, plus vitamins C and E, to moisturise, soften and help protect lips. The lightweight formula is comfortable and non-sticky, and fragranced with a signature fig scent.